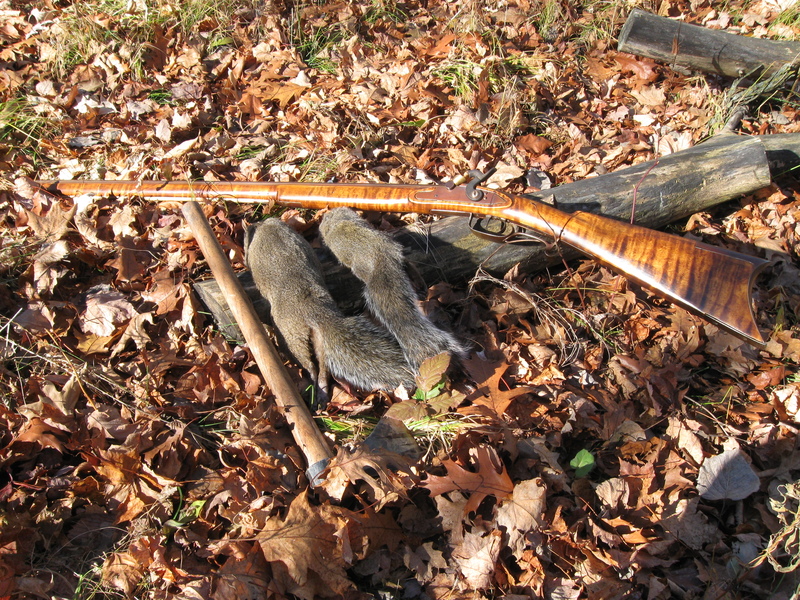 Squirrels taken with gear handmade by the BPB: 36 caliber Southern Mt. rifle, horn, pouch, powder measure. We are a group of people who enjoy the outdoors in a more traditional, old fashion way. We tend to shy away from the latest high-tech gadgets and trends. We are old-school woodsmen. We like to use traditional methods and materials whenever we can, even if it means other people look at us with a quizzical look or talk about us like we’re not there. We don’t care! After all we are Black Powder Beagles! And here at Black Powder Beagles we have two mottos, one for us, and one for the dogs. Those mottos are: Here at Black Powder Beagles we do everything differently,and Beagles just want to have fun! As mentioned earlier, we are old school woodsmen, sticking to traditional values, methods, and materials whenever possible. So what does this mean? Well, to us traditional values include having respect for the game, fair chase, eating/utilizing what we harvest, taking only what we can use, sharing the bounty, passing on the knowledge we have to the next generation and to those who want to learn, good camaraderie, and giving thanks to God for what we have. Traditional methods include what has worked for others through the generations; usually these are simpler methods requiring determination and practice to acquire, and are many times not used by people because of this. Many of these skills are taken from Native Americans of the past, as well as the Mountain Men of previous centuries. Some of these methods include: grunting or rattling in deer, still hunting, calling squirrels, getting grouse to reveal themselves, watching and listening, and the occasional old family secret. To us traditional materials are important because they keep things simple. Starting with gear we are opposed to using such things as GPS and ATV’s unless you have no choice. Walking, XC-skiing, dogsledding, or snowshoeing are our preferred methods of travel. They may be a little slower but allow us to see more. Of course a good 4×4 is needed to get us to the woods- let’s not be stupid! Map reading and using a compass are two skills that are important, especially when we get lost in some endless tamarack swamp chasing down the beagles. Believe us, we’ve been there, and over there too. When it comes to traditional fabrics we like lots of wool, leather, and wood. These are natural materials that are very durable and are renewable. They don’t melt, are quiet, warm, flexible, rugged, and just plain look good. Sometimes we can’t find what we are looking for so we make our own; from tents, to clothing, and equipment such as ice chisels, toboggans, powder horns, and even guns. So what do we do with all this? Well, here are some of the things we do: We enjoy introducing young people to the outdoors; we obviously hunt with black powder guns and hunt with beagles. Grouse hunting is one of our favorites, and we typically do it without dogs. Turkey hunting, rabbit and squirrel and varmint hunting are on our list, along with deer hunting, often from the ground while rattling and grunting (while using bp guns). In the winter it’s snowshoeing, xc skiing, ice fishing, and traditional winter camping. We don’t stop with hunting: trout fishing mini creeks for brookies is a favorite past-time as is foraging for wild edibles like leeks, chokecherries, plums, fiddleheads, blueberries, morels, harvesting wild rice and making maple syrup and others. There are many seasons in the life of a Black Powder Beagle! AS YOU CAN TELL, THIS IS A “CLUB” THAT IS VERY POPULAR. WORLDWIDE OUR MEMBERSHIP IS UP TO 26! WANNA JOIN?? Hunt with black powder(BP)——actually take game with BP——-hunt behind beagles——hunt in front of beagles-it happens——trout fish mini creeks——harvest wild rice——like and pick blueberries——produce maple syrup——like to catch and eat fish—–enjoy silence—–forage for wild foods: leeks, fiddleheads, morels, wild berries——know what morels, leeks, and fiddleheads are—–enjoy traditional winter camping——-harvest grouse by: shotgun, rifle, handgun, BP, slingshot, archery, pellet/BB gun, by hand, motor vehicle—–enjoy being outside under a full moon in winter, sitting on the ground when it’s ten below zero—–use/own wooden snowshoes—–own or want to own mukluks—–know what mukluks are—–would rather hunt/fish than watch the Vikings or Twins—–have an understanding of wool or owning wool clothing-sox and cap don’t count—–can identify good grouse habitat—–like the smell of burnt gunpowder——love the smell of wet wool, a wet dog, or a grouse woods in the fall—–realize there’s never a bad day in the woods or on the water—–frequently hear the woods calling you—–wouldn’t mind living in Montana—–can identify birds by song, or a coyote by smell—–can identify a trout stream by its aroma—–wish October was 60 days long—–know the difference between a brush wolf, song dog, and a coyote-careful this one’s tricky—–know a deer track from a moose track—–receive Filson catologs in the mail—–hyper-ventilate at the first snowfall—–track the first fall colors—–are always wondering how thick the ice is—–would rather be in the woods or on the water-all year long—–are on the verge of liking winter more than summer-cold winters=GOOOD! !——-THESE ARE JUST GENERAL STIPULATIONS-WE CAN COME UP WITH MORE!! HOWEVER—–If you can claim any of these you may already be a member of the BPB! To be a junior member you must be able to claim two of the above. To be a standard member you must be able to claim three or more of the above. Verification of the aforementioned claims for said membership must be done by at least two(2) unreliable and/or questionable people of your acquaintance, or your town’s mayor. WE WILL NOT VARY FROM THIS!! AUTOMATIC LIFE MEMBERSHIP FOR ANYONE WILLING TO DIVULGE THE LOCATION OF A VIABLE MOREL PATCH! NO, REALLY!! YEARLY DUES ARE AS FOLLOWS: Junior members–2 squirrels and a grouse Standard members–2 squirrels, 2 grouse, and a package of venison tenderloins SO……………………….. IF YOU WANT TO BE STRANGE, LOOKED AT FUNNY, HAVE FUN, BE STRANGELY ADMIRED OR TOLERATED, TALKED ABOUT, LAUGHED AT(BESIDES YOUR WIFE), HAVE THE ODD SATISFACTION OF KNOWING YOU DO EVERYTHING DIFFERENTLY, COME AND TALK TO US, WE’LL LISTEN! !